Our ‘Dual Focus PhD’ series tracks the working lives of our part-time PhD fellows. Many work at the highest of levels, both nationally and internationally, including for other parts of the UN System. They come to Maastricht for our unique PhD Dual Career Training Programme in Governance and Policy Analysis (GPAC²). 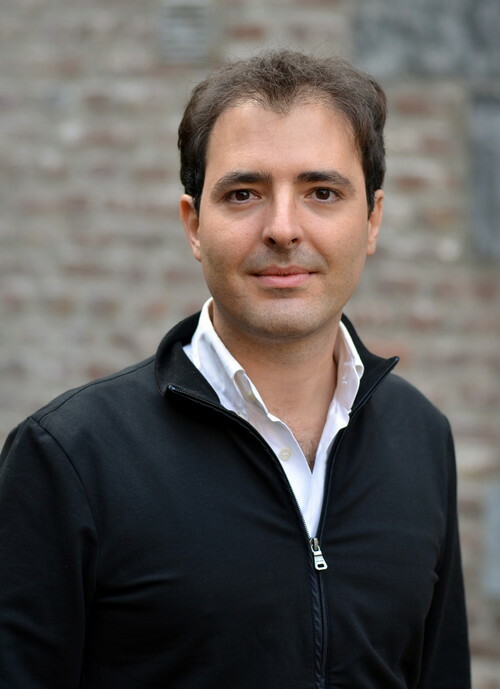 This time we speak to Vincenzo Vinci, who currently works for UNICEF in Addis Ababa. He defends his PhD thesis on 22 November 2018. You’ve worked for UNICEF on social policy, programme planning, monitoring and evaluation – across Africa and Asia. Can you explain the core of your work? I’ve worked for UNICEF on programme planning, monitoring and evaluation, focusing not only on countries in development but also humanitarian contexts. This has given me a deep understanding of how to tailor programmes in order to ensure a timely and effective response – especially in emergency situations. As I grew professionally, my interest shifted to research, social policy and social protection. I decided therefore to start a PhD on social policy and social protection. I’m currently managing the research portfolio of the UNICEF Ethiopia Country Office, which includes the development of studies, research and evaluation with a focus on child poverty and well-being. I also support the design of social protection interventions and related research and evaluation activities. I work closely with government and donors, while advocating for child rights across Ethiopia. So my role is well-aligned with SDG 1, particularly in terms of generating new evidence and rolling out programmes. You have to be culturally aware in your work, but in everything you do at UNICEF you must focus on the next generation. Can you give examples of policies unique to certain countries that are either succeeding or failing? What I really enjoy is focusing on different nations, and seeing what works (or not) in certain contexts. Countries may be affected by chronic emergencies such as Ethiopia or Mali, which are regularly affected by droughts; or by unexpected events, such as the tsunami in Indonesia or the earthquake in Nepal. These events put at risk people’s lives and have a direct and indirect impact on poverty. Of course, there are similar themes for humanitarian response in terms of programme interventions, but programmes always have to be respectful of traditions and cultural values which are typical of the specific country-contexts. For example, both Ethiopia and Nepal are implementing social protection interventions. Ethiopia is famous for one of the largest cash transfer programme in Africa. Nepal has increased over the past years its commitment to social protection and the scope of child grants. While these two countries are fundamentally different, the emergencies have been used as an opportunity to increase the scope of existing social protection programmes, which in turn makes the response more rapid and delivery of benefits more effective in reaching the most affected populations. It’s not always clear how investment in social protection leads to inclusive development. How did your study add to that debate? Right now I’m living in Addis Ababa with my wife – the most beautiful woman – and lovely children: Alexander and Milo. My research looks at the extent to which and how the quality of institutions and the voice of people affect the size and shape of social protection interventions. Plenty of studies have already investigated the affordability and financing of social protection interventions, while other research looks at how institutions affect economic development. However, there is a gap in researching these factors together and using different methods of research. The first part of my research looks at 80 countries and tries to understand if there is a link between the quality of institutions, people’s preferences and the level of expenditure on social protection. The second part, using case studies conducted in Nepal and Ethiopia, explore how these two factors play a role in the provision of social protection interventions. Findings suggest that current social protection programmes should focus on ensuring effective and efficient institutions, but also improve people’s participation in the implementation of social protection. The part-time PhD programme allows mid-career professionals, including policy specialists like yourself, to do a PhD alongside their day job. Does being a researcher make you a better policy advisor — and vice versa? Yes, and I certainly feel lucky! My current work focuses on research but I am also heavily involved in designing social protection programmes (and related research). In this sense, the PhD can only help my current role and add substance when advice is delivered to policymakers, counterparts and other stakeholders. I also believe that as a policy adviser you have to know what is feasible and politically acceptable, while as a researcher you are responsible for ensuring rigour in research and a high level of objectivity. Of course policy advice and research findings are not always ‘compatible’. 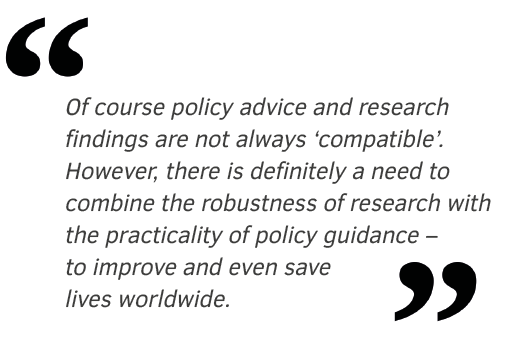 However, there is definitely a need to combine the robustness of research with the practicality of policy guidance – to improve and even save lives worldwide.